She's funny, smart and the undisputed queen of one-liners. Twinkle Khanna aka Mrs FunnyBones had the audience in splits at the recently held Vogue Beauty Awards 2017. While she didn't attend the awards, she wrote her husband Akshay Kumar's acceptance speech, when he won the Man of the Decade Award. And we must say that it is the most hilarious one we have heard recently. 'My wife has given me a speech. So, I will have to say this. Bear with me,' said Akshay Kumar as he started the speech. "To my overpaid trainer, and my underpaid cook, a big thank you for helping me maintain this 'Beautiful Man of the Decade' body which I have. 'Though part of the credit should also go to the fact that I did not have to carry my two children for nine whole months. And thus my stomach did not have to stretch to elephantine proportions, and then deflate to a small paunch with stretch marks and saggy skin that no amount of dieting can eradicate. 'So I'm eternally grateful to my wife for sacrificing her own vanity and producing our wonderful children. Saving me from ruining my figure and my chances of winning this award. 'It's time for me to wind this up because it's really not fair that I always reach home late, and I should not take anyone so much for granted. And this is not the first time that Twinkle has wowed us with her wit and hilarious tongue-in-cheek humour. Take a look at the many times when she showed us how to be a rockstar wife! Twinkle said this at an awards function. The duo have been married for over 16 years and have two children, Aarav and Nitara. Maybe it's true that opposites do attract! 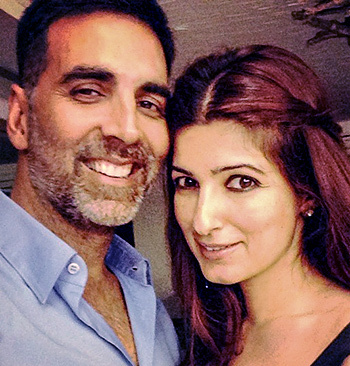 Twinkle has often gone on record to admit that Akshay and she are poles apart. Twinkle was at her sassy best when Akshay won the National Award for Best Actor for Rustom. Speaking of sass, Twinkle had us LOLing with her zingers on Koffee With Karan!